WA8PGE suggested I enter this event. I followed that suggestion and had a great time. Conditions on 20 were not great, so most of the time was spent on 40. Here, most of the activity seemed to be around and above 7040 kHz. Lots of activity was heard around 7030 kHz, but that included few if any contest stations. Outdoor antennas are not permitted in my neighborhood, but I remain a good neighbor with a stealthy antenna and mostly operate with low power. Rig: Icom IC703+ set at 5 watts output. Antenna: Stealthy inverted L, 30 ft vertical, 40 ft horizontal. I started on 20M and stayed there! Last month my ATS-3A developed a serious receiver problem. In other words it is totally deaf. The problem has not yet been solved, so out came the older and heavier ATS-3. It was built seven years ago in an Altoids box with a pair of 650 mAh LiPo cells, metal paddle, serious connectors, etc. The bottom line is that it is twice the weight, but very durable. After a little experimentation and re-education on its operation, I was on the air. The signals on 20M were not loud, but very easy to copy. Thanks to K7RE, W4VHH, WA8PGE and K8AX! I hope to have the ATS-3A fixed by September... We will see if that really happens... The power output stayed around 3 Watts for the duration with plenty of extra battery capacity for calling CQ. Used my newly built OHR 100-A running 5W to a mini-beam at 25 ft for 6 Q's on 20 meters and my ole trusty Ten-Tec 1340 at 5W to an inverted vee at 40 ft for 6 Q's. The activity on 20 was kinda sparse even though I think it would have supported a lot of Q's - worked stations in IL, MO (x2), TX, SD, and BC. 40 was lively, as usual, and noisy, as usual, with propagation up and down the east coast. All in all, a good sprint and it's nice to have another band to play with without adding a lot of weight. Thanks to everyone that heard me and thanks to the organizers. Hope to see you all next month. K3/10 @ 5w to a 20M wire delta loop. I guess everyone was tired after the FotBBs on Sunday. 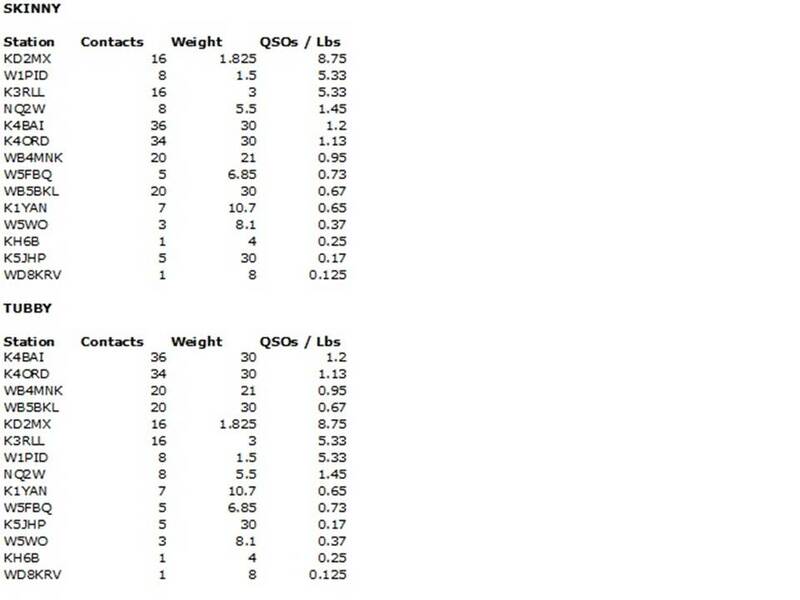 All contacts on 20M and most from the midwest - except K7RE's nice 1w signal from South Dakota. Tried 40M, but not enough 'oopmh' tonight for K4ORD to pick out my call. Thanks to all. Had fun. First time doing spartan sprint, lots of fun! Thanks to everyone for putting up with my keying, I was using my iphone app iDitDahText as paddle and keyer which I'm not as used to at 25wpm. Station is K1 running 5w into a ZS6BKW up about 35' at my parents lake house on beautiful Lake Winnipesaukee, Moultonborough NH. 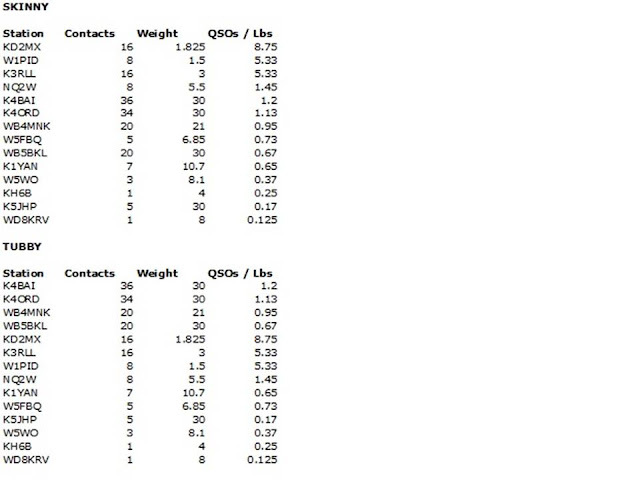 12 contacts on 40M and 2 on 20M. I'll get the antenna up higher next time at my home QTH in N. Conway NH. My first-ever Spartan Sprint. I only had a few minutes to operate from the shack at home, but it was great! I made my first-ever 1,000 mi/watt contact with SD (1,277 miles, 1w both ways, on 20m), and my first-ever milliwatt contact (OH, 425 miles, 500mw). I'll be back! I ran a K2 on battery power to a 45' vertical wire. Hmm, I need a lighter battery and a mini/portable key to bring down my weight. I only did 20M, as the thunderstorm QRN was unbearable on 40M and below. I used my Sierra and a Chinese li-ion battery rated at 8 AH, but probably yields more like 4 AH. I sure wish that we could scare up more activity. I worked several 1W stations on the east coast, so propagation could not have been too bad. I alos was only running 1W out of the Sierra. Antenna was my 3 element ancient tribander. I had looked forward to the SS this month, but got busy with the log for the US Counties QSO Party held last weekend and forgot about it. Got on for the lat 17 minutes. By that time, there were no SS signals on 20, 80 was noisy with no SS activity heard, and 40 was pretty good, but most of the activity was over. Managed 7 QSOs from TX to NY. Got K6JSS/7 in NV on 7031 just after the SS was over. Thanks to NW2K for the reminder about the SS that I did see in time to have a little fun. See you all next month for the whole two hours, I hope. This weekend in NAQP CW, I will be signing W4AN single op from the WW4LL station. Hope all of you will be active in that fun event. Nice to do a Spartan Sprint again. Used my newly completed ATS-4 with my 80m inverted vee. The ATS-4 was powered by a 3-cell (11.1v) LiPo battery. All contacts were on 40m. I quit about 0220 UTC. Never heard anybody on 20 or 80, in spite of several CQs and listening several times. There was a DX pileup around 7.033MHz that was LOUD at times! Thanks for the Q's! First Spartan sprint for me. Rig was a K2/10 with internal battery and a Palm Mini Paddle. Antenna was a G5RV. Contest was a blast. Started on 20m and found N5OE in TX operating QRP and 20m was relatively inactive. Immediately found K3RLL on 40 meters. Soon the region around 7040 was ablaze with activity calling CQ SP. I made most of my contacts there. The prize was back on 20m. SD was calling K7RE. I have the devil of a time getting SD QRO and now I can hear SD QRP power - WOW!!!. Thanks to all who participated. Lots of S9 QRN on 40M again, made 1 qso on 20M and 13 on 40M, Two stations called that I could not get out of the noise, one had QL in the call. Rig K3 @ 5Want 40M dipole up 40.' Thanks to all. Very few on 20 meters even though I think the band was in good shape. 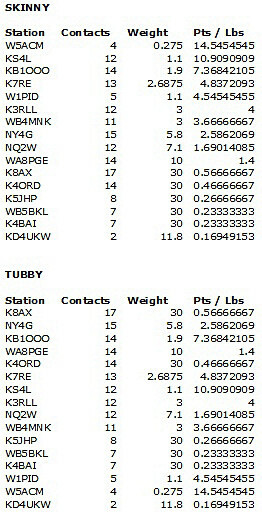 Stations on 40 were strong ... especially K3RLL and WA8ZBT. I think participation is approaching the lowest I remember. I only operated about 12 minutes. I ran an HB-1A at 4W with a 65 foot wire out a second story window. It's kind of an emergency antenna, but simulates conditions in the field pretty well. Thanks to all for the QSOs. FT-817 to G5RVjr up 40’ – Nothing heard on 20 or 80 here. Signals sounded weak on 40 tonight, except for K4ORD of course, but appreciate all those who pulled me out of the noise. Nice to contact WB4MNK back in FL from here in rural PA summer home. Tnx to all. Hoping for better prop condx next month. Have not played in a sprint in too many months. Broke out the K1 for a good time. Not much on 20M but did ok on 40M. Could not stay around for the entire two hours though. Ran K1@4W to my zig-zaggy ~600' loop up about 25-30'. and a R5 vertical. Aloha. a nice end to the 4th. My thanks to all. Had fun. Went back to the homebrew Ten-Tec 1340 to a 40m inverted vee at 40 feet. This limits me to one band but reduces my weight by a factor of four. All in all, always a lot of satisfaction out of making contacts with a homebrew key, keyer, rig, antenna supports, and antenna. No complaints from this station. Thanks to everyone that made it into my log. Hope to see you all and more next month...maybe I'll have my OHR 100-A for 20 meters done by then. Started on 20M had 8 qso's there from GA to WA, on 40M where the QRN was rough made 26 qso's with best dx AB0CD in CO. A few stations I was unable to copy in the QRN on 40M, nice to work John, K3WWP in the closing seconds of the sprint. looking forward to next month, tnx to all. 4 contacts using HW-9 and 1 contact using FT-817 Butternut vertical w/radials. FT1000MP, 5W, TH6DXX, dipole 40, inverted vee dipole 80. Low bands were very noisy from local thunderstorms. 20M was fair, but needed more activity. 40 signals were strong with no skip zone. Worked two other stations in my state (GA). 80M: worked only N4DU on a QSY from 40M. Hope for more activity next month. Thanks for all QSOs. I will be W4AN in the IARU contest this weekend. Thunderstorms, about 60 miles away, provided S9+ QRN on 80 and 40, limiting things to 20 meters. Propagation was not great but I managed to add 2 QSOs to my previous total. FT-817 @ 5 watts to a G5RV @ 30 ft. Operated about 20 minutes with HB-1A OCF dipole. Thanks all for the QSOs. 20 was nice and quite but 40 was noisy so sorry if I was unable to copy you call but maybe next when 40 is not as noise. Had fun and was able to work K3RLL Don in PA who is responsible for getting me interested in this QRP CW stuff. Got in for the last 45 minutes on 20 meters. Lots of local QRN due to storms. Worked 1, but heard 3. Limited time but nice to hear so many familiar calls tonight with pretty good conditions on 40 meters. Nothing heard here on 20 or 80. K3 TO 20 METER EDZ DIDN'T FIND TOO MANY STATIONS ON. 20 METERS WAS GOOD. 1 CTC ON 40 HERE ON THE TX COAST.